Enjoy this fun family house. The house has a well stocked modern kitchen that opens to a big eat-in area overlooking the covered lanai and solar heated pool. The lanai is a wonderful area to grill or chill out! Walk up to the beach with your morning coffee and enjoy the sunrise. When you come back from the beach, you can rinse off in the outside shower. After a fun day at the beach relax by the pool or take a stroll to the end of the street and watch the beautiful Florida sun set over the Halifax river. The house is designed for easy living in the Florida lifestyle. The living room has a large HDTV, working fireplace and it's a great place to gather to watch a movie or play games. The den has a queen sleeper sofa and is a great place to relax with a good book or your computer. The house has wireless internet connection. The house is very pet friendly with a fenced back yard (No rear neighbors) and attached two car garage. Bicentennial Park is 2 miles south of the house with a terrific Dog Park w/big dog & little dog sides. The park is open sun up to sun down. Everything you need is here. This is your "Beach House" away from home, feel free to relax and enjoy! As an active Commercial Realtor in Orlando I do not get to go away for long periods of time, short weekend trips are more likely. Then there is the four legged 'kids' to take along also. So I decided to invest in a comfortable house close enough to get to and far enough to get away from it all. Ormond by the Sea is perfect! Big eat in kitchen for my chef husband, fenced back yard with no rear neighbors for our 4 legged 'kids' and a nice pool area within walking distance from a beautiful beach for me. What more could a girl ask for. My beach house is relaxing and close to everything but far enough away to feel like you escaped. My family and I love to spend time at the beach and the house is just right for a getaway. Ormond by the Sea is a 'drive free' area of beach just north of busy Daytona. A1A runs directly along the water so there are no buildings on the beach side. Sunny Beach Dr. has the Beach on the east end of the street and the Hlifax River on the west end, making it the perfect place to ride your bike or take a nice walk. Ormond Beach has good shopping and restaurants and Daytona is just 15 minutes south for the night life. Beautiful sunrise and sunsets. Fantastic walks along the beach. Wonderful ocean air at night and the cool ocean water in the summer. The relaxing beach atmosphere is intoxicating. Plus NO rear neighbors. We are a Pet friendly home with a nice fenced yard & no rear neighbors. The Dog park, Bicentennial Park, is just south on A1A & Flagler Beach , just north, allows pets on the beach. We have bowls, leashes, blankets and a litter box. The house is 8 doors from the beach and 1.5 blocks to the Halifax river. Our Girls Trip stay at Christie’s beach home was absolutely wonderful. We enjoyed spending time with each other in the beach home and exploring some of the landmarks in the area. We had everything we needed at the beach home. We will be back again. Thank you Christy! We would like to thank Christy for allowing us to stay at her rental house in Ormond Beach, FL. We had a wonderful vacation and did not want to leave. The house is lovely and we (a family of 4) felt right at home. Everything was very clean and easy to keep clean with the wonderful tile flooring. The backyard is beautiful and my pug, Bruno, loved it too. After spending days at the beach, we enjoyed hanging out at night on the patio by the pool, listening to the sounds of nature and doing some star gazing on clear nights...we even saw some shooting stars! The walk from the house to the beach is merely 5 minutes, even with carrying beach gear that is provided in the garage...like chairs, beach umbrellas, and boogie boards. I also loved the convenience of having a clothes washer and dryer in the garage. There are two restaurants we tried that are nearby on A1A: Betty's A1A Café, and Alfie's Restaurant, and they were both really good. If you want to venture further out, we recommend Hull's Seafood Market on 111 W Granada Blvd. The next time we vacation in Ormond Beach, we would love to stay at this home again and will definitely be contacting Christy. She is a great person who answered all of our questions promptly and politely. Thank you very much, the Ferrell's. Thank you so much for taking good care of the Beach house. We try hard to ke2the house clean and comfortable for everyonw. Not having g rear neighbors makes the yard feel big & private. I'm so glad your family had fun, come back soon. Thanks so much for taking great care of our "Beach House". The new back fencing makes it really secure for our furry family member's while allowing you to still have an open view of the green belt behind the house. We are fortunate not to have any rear neighbors and a large wooded area for the birds. This green space gives a lot of privacy while only a half a block to the beach. Please come back soon with your family to make more summer Beach memories. This was our first stay at The Sunny Beach House and we absolutely LOVED it! Everything you could possibly need was available and the house was well-stocked. The weather was unseasonably warm which only added to the incredible stay. I truly appreciate the fact my entire family was welcome so the holiday could be spent as it should be - surrounded by those you love whether human or canine. My dogs (2 Great Danes) had plenty of running and play room in the fenced backyard while the humans relaxed by the pool and took a Christmas swim (thanks to great weather and a solar-heated pool). If not relaxing by the pool, we were enjoying peaceful walks consisting of ocean views and river sunsets. The neighborhood was quiet and the neighbors were very nice. This was the first beach experience for the danes and it was so much fun watching them try to figure out the sand, sea birds, and the ocean at the dog-friendly Flagler Beach which was a short 5 minute drive from the house. Centennial Park was another dog-friendly area nearby. Needless to say, the dogs seemed to enjoy this vacation as much as we did. In addition to the amenities and dog-friendly hospitality, Christy was very accommodating with our arrival and was easily reached when I had a few questions. Thank you for being a great owner and your willingness to share your beautiful home! You made it possible for my whole family to be together for one of the most relaxing and carefree trips I've gotten to enjoy in a very long time. We will definitely be booking this home in the future and highly recommend staying here. Dog-friendly, well-stocked, relaxing atmosphere, kind neighbors, quiet neighborhood, ocean and river views within short walks, convenient location to sights, shopping, banking, grocery, etc. and so much more! Oh, did I mention you can hear the ocean waves crashing on the shore while sitting on the back porch? Or how beautiful the nighttime sky looks from that same back patio? There's so much more, but needless to say, you can't go wrong with this house! Thank you so much for choosing the "BEACH HOUSE" for your holiday vacation. We work hard to make all our guests comfortable and keep the house stocked to ensure everyone can have a good time. even our four legged ones. With the beach, river and parks within walking distance it makes it easy to keep everyone entertained. My husband, I and parents stayed at the beach house over the Thanksgiving holiday along with our dog and we loved it. The house has everything you could possibly need and then some. It was very clean and having the pool was a great addition! The fenced back yard was great for our dog, we didn't have to worry about him while we were out there enjoying the patio and pool. The 2 full bathrooms worked out perfectly and the house has plenty of room for everyone! I would definitely recommend this place for anyone that is going to Ormond Beach. It is so close to the Ocean, intercostal, dining and shopping! We will be staying here again for sure! Thanks so much. We try very hard to keep the house well stocked and clean so everyone, including our furry family, can enjoy their vacation. LOVED this place !! My wife and I wanted to do something different this year so we decided to go on a road trip with our 2 dogs. This place is very clean, spacious, and has all of your basic needs. The backyard alone was fabulous and then to have the pool, covered patio, and fenced in yard with a grassy area for our "kiddies" - you can't beat it !! We will definitely rent this house again in the future. Although the dogs were not allowed on Ormond Beach, we drove a short distance to Flagler Beach and practically had the beach to ourselves as there was only one couple that we saw walking on the beach the whole time we were there. This Beach House is only 8 houses to Ormond Beach so just a very short walk up the street !! We Thank You for letting us stay at your property !! Thanks so much for staying at "The Beach House" We want to make the house comfortable for all to enjoy, including our furry babies. We have a terrific dog park just 2 miles away on the beach side @ Bicentennial Park. 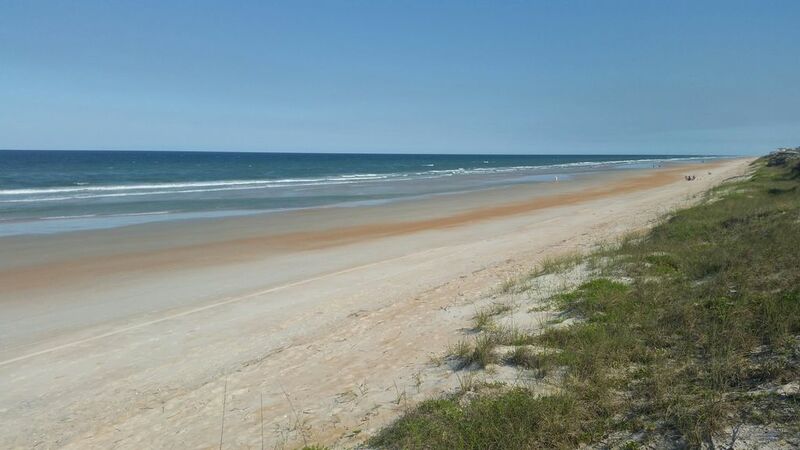 Flagler County beaches allow dogs on the beach and it is just a short drive up A1A. The river also has great swimming areas for the dogs just down the block from the house on John Anderson DR. Our out door shower along with front and back yard hoses makes it easy to wash off the sand for everyone too! Again thanks so much and come back soon. Ormond by the Sea is nestled between the busy Daytona Nightlife and the casual vibe of Flagler Beach. Then their is a short drive North to St. Augusitne or South to the Space Center for a great day trip. Any or ALL Cancellations must be made 60 days prior to arrival One half of the (1/2) Rental Rate is due to reserve the dates the remainder of All fee's is due 60 day prior to arrival. All Returning guests receive a 10% discount on any reservation All Summer Reservations are Saturday to Saturday/ full weeks or longer / June - August Biketober Fest is a special event week Summer Rental Rates Apply Rates are subject to change until reservation is confirmed.